I started the background to this art journal page at the last JJAMMMA (Junk Journals and Mindful Mixed Media Art) meet up in Stockport. I managed to finish it on Tuesday, so at least that is before the next meet up lol. I was working in my leather bound journal full of handmade paper, so I gave the pages a coat of clear gesso and dried them thoroughly before getting started. I started by covering both pages with Distress paints in Stormy Sky, Tumbled Glass and Broken China. After dabbing the paint onto the gessoed surface, I blended the colours together with my fingers and continued adding further colour until i was happy with the coverage. The page was left to dry naturally. That was where I left the page for some time. I wanted to use some magazine clippings that I had as a focal point, so built up the interest in the background using a variety of stamps and stencils from Claritystamp. I started with set 1 of the Petite Mandala stencils, blending over each one with Cornflower Blue Archival ink. Next I added the script stamp from the Journaling set in Mermaid Lagoon Distress Archival ink. I held the stamp in my hand for a varied look. Next, I added the coffee ring stamp from the same set in Cornflower Blue. Next, I added the magazine clippings, the body from an advert for blouses and the head from an article about Star Wars. The images were sealed with Distress Collage medium and dried thoroughly. Faber-Castell Big Brush markers were then blended around the outside of the clippings to add a shadow all round. I didn't feel that the background had enough interest yet, so added rows of dots using the Dotty Wave 7" x 7" stencil and Faded Jeans Archival Distress ink. I also added clusters of the smaller flowers from the Flower Power stencil in Hickory Smoke Archival Distress ink. For the left hand page, I chose a Snarky sticker and three stickers from the Small Talk sticker books by Tim Holtz. As I was working in an art journal, I removed the top layers of a Quote Chip to take away some of the bulk. These were added with Cosmic Shimmer acrylic glue. To finish, I roughly outlined each sentiment/quote sticker using a dark blue fine liner. I can see why this spread made you think of me... the collage is really lovely and I love the quotes. I hope you had as much fun as I usually have making collage like that! Enjoy your day Sarah! Another lovely piece. When I first read your FB page I thought you had set us a quiz !! but realised that you meant the answers are on my blog !! Oh well that saved me trawling through the stamp & stencil sections of the Clarity website LOL when I should be getting ready for a visit from my youngest grandaughter who is coming for a cuddle this morning on her way to Wales. Fabulous journal Sarah! Great background! Hi Sarah, jumped over from FB, saw your post about decreasing views and comments, I hear what you say, I have been negelecting my blog lately partly because of that but like you also say we also do it as a reference for ourselves, but it would be nice if people stopped by and left a comment because we invest time in writing those posts. I just checked mine and I'm nearly at 500. 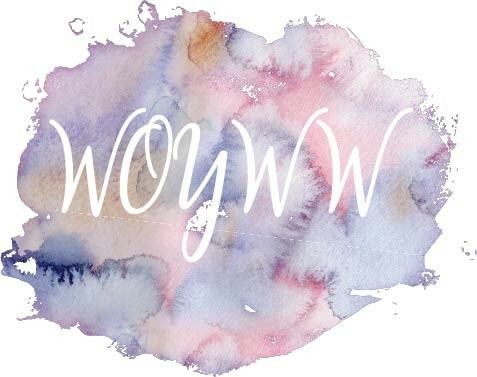 I used to join in the WOYWW gang, but becaus eof time constraint I don't anymore, maybe I should start it again becaus eit is such a great supporting community. lovely spread and great quotes. A is for Acorns and what else? Thanks a Bunch Tag: Turning One Stamp Into Two!